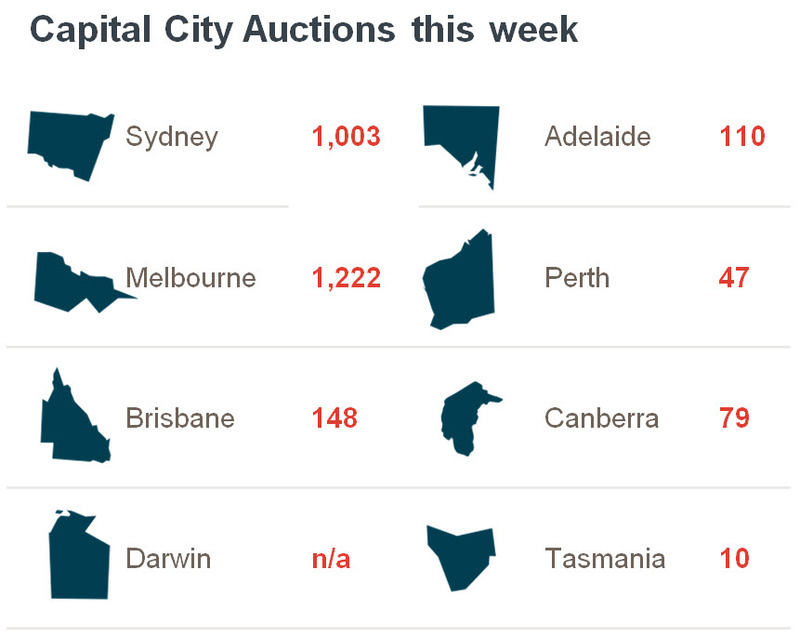 The number of auctions scheduled to take place across the combined capital cities is set to rise this week, with 2,619 currently being tracked by CoreLogic, up from 2,409 auctions last week, and higher than the 1,920 auctions held over the same week last year. Auction activity across Melbourne and Sydney, the two major auction markets, is expected to increase, with 1,222 Melbourne homes to go to auction, rising from last week’s 1,098, and 1,003 auctions scheduled across Sydney, up from last week’s 960. Across the smaller markets, volumes will also increase across the remaining capital cities, with the exception of Canberra where volumes are expected remain relatively steady. Kew and St Kilda in Victoria are the two busiest suburbs for auctions across the nation this week, with 19 and 18 residential homes set to go under the hammer respectively, followed closely by Essendon and Mount Waverley each set to host 17 auctions, both also in Victoria. The combined capital city final clearance rate fell last week, to 72.8 per cent, down slightly from 73.0 per cent over the week prior across a higher volume of auctions, with 2,409 auctions held, up from 1,689 over the previous week. Both clearance rate and volumes were higher than the corresponding period last year, when a 69.5 per cent clearance rate was recorded across 1,876 auctions. In Melbourne, last week saw the final clearance rate decrease to 75.0 per cent across 1,098 auctions, down from 77.5 per cent across 792 auctions the week prior. Across Sydney, the final clearance rate rose to 74.5 per cent, from 73.8 per cent, across a significantly higher volume of auctions, with 960 held, increasing from 592 the previous week. Across the sub-regions, the Northern Beaches region of Sydney recorded the highest clearance rate, with 84.9 per cent of auctions clearing. Across the smaller auction markets, the performance was varied last week, with clearance rates improving in Adelaide and Canberra, while decreasing in, Brisbane, Perth and Tasmania. The Gold Coast region was the busiest non-capital city region last week, with 61 auctions; however Geelong recorded the strongest clearance rate at 74.5 per cent.